Authenticity is an increasingly popular term used to describe commercial building design. If you want to build an “authentic” commercial building, what must you do? The term describes working strategically to design sustainable buildings and interiors with unique branding, graphics and even marketing plans. Using the right materials and professional architects, designers and contractors enables owners to market their buildings based on the features and benefits of their carefully considered designs. James Hardie Siding fulfills the demands of authenticity and modern design seamlessly, and these materials are rapidly gaining recognition among top architects, designers and contractors. Architects praise the Reveal Panel System for its clean appearance, strength, flexibility and durability in commercial designs. The design and materials drew raves at the recent International Builders’ Show in Orlando, Florida, in 2017. James Hardie uses fiber cement textiles to create durable and aesthetically pleasing building exteriors, and the manufacturer ranks as the world’s biggest dealer in fiber cement siding and panels. Using James Hardie materials can raise your game when designing a commercial property by integrating a unique brand identity at every level. This approach helps your building to tell an appealing story that incorporates architecture, interior design, graphics, sustainability, spatial relationships and more to generate authentic designs that are easy to market, aesthetically appealing and longer lasting than sidings made from other common materials. James Hardie was a Scottish businessman who moved to Australia where he developed a fibro-cement sheeting in the late 1800s. One of Hardie’s biggest customers was Victorian Railways. Fiber cement products have long been a staple in the building industry, but advances in design and manufacturing processes have catapulted fiber cement products to the forefront of modern commercial design. James Hardie products are sold throughout the world at commercial building suppliers and even in DIY supply stores. Fiber cement siding is made from various materials including cement, sand, glass and cellulose fiber. The material resists insects, fires, moisture and ultraviolet rays. The siding won’t warp, peel, rot or swell, and it can be cleaned easily with high-pressure washers. Many fiber cement siding manufacturers offer 30-year warranties on their products. However, both the International Association of Certified Home Inspectors and National Association of Home Builders predict that properly installed fiber cement siding should last for 100 years or more. The siding might need a paint job, but that’s about all the maintenance it needs besides washing. Lap siding offers a range of decorative configurations and colors with deep shadow lines, tongue-and-groove joints and superior structural integrity. You can easily create a cedar shingle appearance with HardieShingle siding, which is perfect for a Cape Cod decorating style. The shingles look like real wood but without the maintenance issues. James Hardie manufactures a signature line of precut planks and panels that provide decorative flexibility for doors, windows, columns and friezes. Panels come in both vented and non-vented styles, the former of which eliminate the need for strip or box vents. It’s easy to match panels and shingles to simplify installation. The Artisan Line uses thicker cuts for a more authentic appearance and greater durability. Working closely with architects, designers, contractors, roofers, siding specialists and city officials is important in commercial building design. Each of these stakeholders in your project can be big advocates for authenticity, functional design and the right mix of investment costs vs. return on investment. 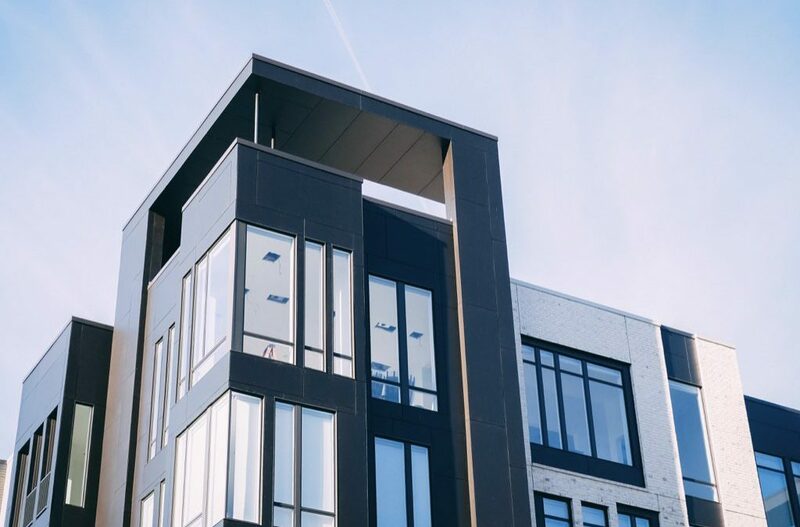 Spending more for quality construction upfront can save over the long-term outlook by reducing repairs and maintenance costs while attracting tenants with clean, appealing and easy-to-maintain exterior designs. As a commercial builder, it’s important to work with architects, contractors and roofers. Your planning process should include choosing construction materials before building begins. Planning your work to use James Hardie shingles is an ideal approach for the siding of commercial buildings of all types, but another major concern of builders is commercial roofing. Choosing the right roofing materials and contractor is critical because roof repairs and maintenance can easily become the biggest landlord expense after your building is finished. Roofing and siding concerns remain uppermost in the minds of landlords because maintenance can generate ongoing expenses, and the materials used have environmental consequences that can affect your standing with the neighbors, contractor productivity and community pride in the neighborhood. Commercial building floor space is expected to grow to 126.1 billion square feet by 2050, which is a 39 percent increase over 2017 levels. Commercial buildings consume more than 18 percent of all energy in the United States, and your choice of siding and roofing can greatly cut energy consumption or waste energy if you’re not careful. There are more than 50,000 companies in the United States that work in some aspect of roofing, which incudes repairs, installation, metal fabrication, siding and other areas. The industry generates more than $31.4 billion annually, and the costs of maintaining commercial roofing are a big concern for owners. • Metal roofing is more expensive but lasts longer. • Some neighborhoods and communities regulate roofing styles based on local weather and aesthetic appearance. • Asphalt shingles are the most popular roofing material, but they often require greater maintenance and more frequent repairs and replacements. • Roofing types include gable, mansard, hip, flat, skillion, butterfly, jerkinhead, saltbox, bonnet, curved, sawtooth, dome, pyramid and combination roofs. • Materials include asphalt and fiberglass shingles, rolled roofing materials, standing seam metal roofing, slate shingles, eco-friendly materials such as moss and grasses, rubber, EPDM roofing, wood shingles, clay and concrete shingles and thermoplastic polyolefin, or TPO, and ethylene-propylene rubber mixed together. There are many possibilities for commercial roofs, and some are more attractive for commercial buildings than others. Metal roofing, TPO roofing and EPDM roofing provide high levels of durability and weather resistance to make them attractive roofing options for commercial projects, and these roofs work well with James Hardie Siding to create stunning designs that last for years with minimal maintenance. Metal, EPDM and TPO roofing are ideal choices for commercial buildings. Metal roofs can withstand just about any kind of weather or climate. Expert roofers can use coatings to improve reflectivity and make the roof more energy-efficient. TPO is a thermoplastic membrane that lasts from 15 to 20 years, and the material costs less than PVC plastic. In fact, flat TPO roofing can last even longer–up to 50 years in some cases. EPDM roofing is a rubber roofing membrane that’s ideal for commercial buildings with low slopes. The membrane can be fixed to roofs and sealed with liquid adhesives. One of the biggest benefits of this choice is its low cost–around $0.80 per square foot. Proper installation of an EPDM roof can last up to 20 years, which makes it ideal for commercial buildings. Building is a collaborative process,and it’s critical to develop a good working relationship with your architect, designer, general contractor, landscaper, roofer and other building professionals. Working with your team is the best way to solve problems or make changes. There comes a time in any construction project when owners are tempted to make changes based on new ideas. Making unnecessary changes is a big temptation that invariably leads to big delays, cost overruns and unintended consequences in other areas. You’ve spent months designing an integrated project, and any changes you make create ripple effects. Sometimes, changes are unavoidable, but you should solicit advice from your building and design teams to find the easiest way to make changes without generating major expenses and creating problems in other areas. Assembling your team is best done during the planning process. Experts can save you money on materials, securing building permits and planning the construction strategically to use natural landscaping features. There are lots of expert roofers all over the country, and many roofers also install siding such as James Hardie fiber cement products. Ideally, you can hire an experienced team to handle both of these critical aspects of the building process. Renovation can handle your siding installation and roofing for any home or commercial project. The team members will work with you to choose the optimal siding for your project whether the building is being designed for senior living, multi-family use, urban singles, light commercial businesses or your personal residence. That’s why tapping into local experience and skills is so important. Webster Groves receives annual rainfall of 44 inches, which compares to a U.S. average of 39 inches. Wetter environments require special options in buildings to prevent excessive wear and repairs. A local expert can recommend ventilated rainscreen assemblies and other moisture-management techniques to get longer use out of your roofing and siding choices. There are environmental, regulatory and logistical concerns in any building project. Many of these technical problems are bigger concerns for your contractors, but a smart owner keeps track of all the issues that might affect construction. For example, nearby construction or rehabilitation projects might restrict vehicular traffic and create logistical barriers to overcome. OSHA sets limits on the amount of silica dust that construction teams can be exposed to while working. The existing standard was recently revised to require 80 percent less dust. James Hardie has been working proactively to get ready for this change, and its products will meet or exceed every government standard. This standard covers silica dust created by all construction materials such as concrete, brick, drywall, stone, wood, asphalt, wood composite, siding and other materials. During planning, it’s important to consider energy efficiency, the cost savings of using smart home controls and the effects of erosion and possible pollution during storm runoff. Possible solutions in commercial projects include using porous materials for paved surfaces, planting native vegetation and designing rock gardens and other outdoor features instead of the ever-present and high-maintenance grass lawns that are the standard of most communities. Planning carefully and working collaboratively with your building teams are the most important aspects of successful commercial building. Your teams can help you design a building that meets your needs, takes full advantage of the building materials you want to use and delivers a finished building that meets any environmental, aesthetic and performance standards that you set. If you have further questions about James Hardie Siding or commercial roof options, contact Lifetime Roofing & Renovation today. Allurasa.com: How Long Does Fiber Cement Siding Last?